ILYB | What Does ILYB Mean? ILYB means "I Love You Baby" and "I Love You Both". The abbreviation ILYB is most commonly used with the meaning "I Love You Baby", as a term of affection between two people who are romantically involved. ILYB is also used with the meaning "I Love You Both". In this context, ILYB is typically used by a child or young adult when saying goodbye to parents or grandparents. It could also be used to declare that someone is romantically attached to two people. 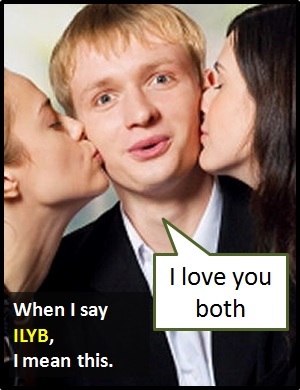 ILYB also used with the meaning "I Love You Baby". Parents: We're so proud of what you've achieved. Child: I couldn't have done it without your help. ILYB so much. Anna: You've got to choose between me and Anita. The abbreviation ILYB is typically used as a standalone declarative sentence (i.e., a statement). It is not normally used as another part of speech within a wider sentence. Before the digital era, we would have just said "I Love You Baby" or "I Love You Both" instead of using ILYB.